There was a big head of lacinato kale that I purchased at the farmer’s market two weeks ago sitting in my crisper drawer taking up much needed space. I had intended to create simple massaged kale salads for lunch every day last week, but instead opted for salads using CSA greens. This week the beautiful monster was starring me in the face and I knew it was time to use it for something. 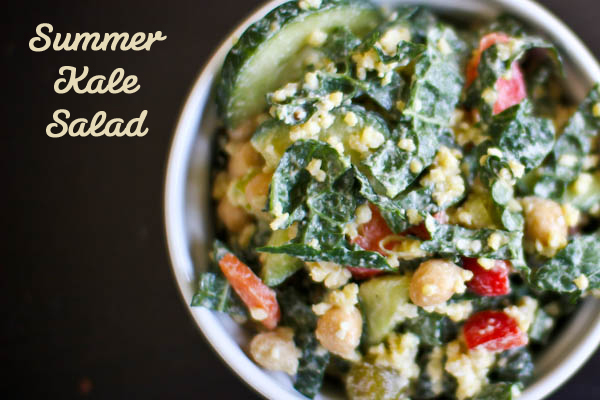 Enter the Summer Kale Salad. This is a very easy salad to throw together on Sunday afternoon for your week’s lunches. Simply mix everything up a LARGE bowl and divide it into 4 cup glass storage dishes. You’ll be left with a quick, easy, grab and go complete lunch packed with local produce, whole grains and protein! Prepare millet using this method. Set aside or refrigerate to bring to room temperature. While millet cooks and cools prepare the veggies and fruit as outlined above. 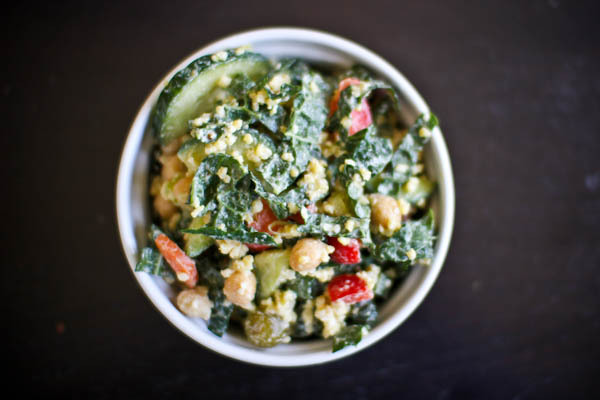 Combine all ingredients (veggies, grapes, millet, chickpeas, hemp seeds, chèvre and mint) in a VERY large bowl. Place all dressing ingredients into a blender or magic bullet and process until emulsified. Pour dressing over combined salad ingredients in large bowl. Mix to combine. You may want to use your hands for this step to gently massage the dressing into the kale and distribute the millet evenly throughout the salad. Best when chilled for at least 1 hour to soften kale. Will keep in fridge for several days. That’s my kind of salad!! Looks delish. How are you!? Best wishes for a great summer!